Fire-in-the-blood corner - Too many vireyas? Our companion animal article is temporarily replaced this newsletter with a new occasional series, hopefully on-going, airing controversy and ideas. Do you agree with Cliff? Are we putting too much emphasis on vireyas? They appear a lot in the newsletter, our NQ expedition is about vireyas, we have built a Vireya house and in this newsletter Graham Price is launching a new Vireya hybridisation project. In terms of the amount of effort the few active volunteers are able to put in, the vireyas and the asiatics get equal billing but what is done is determined by the interests and energy of our active members. It also depends on the season and which project is in progress at the time. Vireyas may get more press because they flower all year round and we can always get pictures for the newsletter. When we are producing an article on what is happening now it is eye catching to have a flower picture. When it’s the depths of a cold wet winter and there is a warm vireya house with flowers, I know where I would choose to get the picture of the moment! 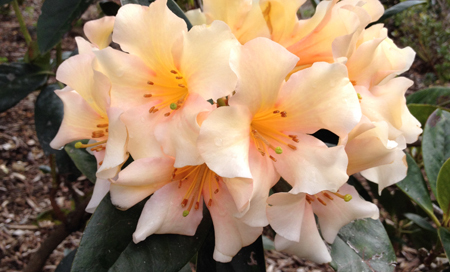 Check out the ARS website and the links to the Pinterest and Instagram pages (buttons at top right) to see how many photos of big-leaf Rhododendrons we have. As on ongoing project our asiatic species collection is being reinvigorated with known provenance seed of new species of being imported and cultivated. We now have a large number plants, both species and hybrids, propagated from cuttings by our very small band of volunteers which are ready for sale or plantings. In discussion with Parks Victoria two new areas have been ear-marked for further expansion of species plantings. Updating our existing collection of asiatics at NRG takes much of our time, with weeding, pruning, mulching as well as GPS and labelling to update the database to find gaps in the collection. We have are around 450 species and loads of hybrids including Australian hybrids - we just need more hands on help to get everything done.